Summer is over, school is back in session and the holiday season is upon us. Have you taken time out for yourself recently? Wake Forest has plenty of day spas to help you take some “me time.” One of my favorite treatments is a one hour massage. Unplugging for one hour is not only good for your soul but also mind and body. The Skin Spa of Wake Forest offers a variety of aesthetic and massage treatments. They encourage incorporating these treatments into your routine for healthy skin. Not only do they offer Hot Stone, Pregnancy and Reflexology massages for different lengths of time but you can also add on an enhancement such as a scalp massage or foot scrub. If you are looking for a skin treatment they have something for everyone. Facials, hair removal, mud baths, and sea weed wraps are all available to assist in relaxing you. The Skin Spa of Wake Forest is conveniently located at 1890 S. Main St, Suite 200. If you are looking to relax at a full service spa, Body Bliss Salon and Spa is somewhere you should visit. They offer everything from hair, massages, facials and nail treatments plus much more. 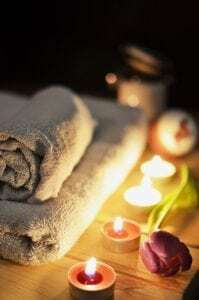 This day spa is meant for you to relax and treat your whole body. If you are short on time and just want a pick me up try a blowout and a manicure. If you have time enjoy a mani-pedi with a facial treatment or massage. I enjoy their Trigger Point Massage and Oxygen Facial. It is just what I need to take some time for myself and be ready to take on life. The Body Bliss Salon and Spa offers all the treatments you need to revamp and relax. They are located at 10520 Ligon Mill Road, Suite 120. Salon Serenity and Spa is an escape from the hustle and bustle of life you do not want to miss. Located off Durham Road in Wake Forest this is just the place to relax. With a variety of services I suggest to experience the A Day to Remember package that refreshes you and your mind while you relax. If you are looking to relax with some friends they offer a Spa Party great for bachelorette parties, birthday parties or just a day to gather and relax. They also offer hair treatments, tanning, make up application and so much more to enjoy. If you need to prep for a night out on the town try out their blow outs or make up application services. Are you looking to relax and revamp your skin? The Heritage Med Spa has all kinds of treatments for you. Their medical aestheticians will help revamp your life and skin. They offer injectables such as Restylane, BOTOX and Dysport. Other medical treatments offered are chemical peels, laser treatments, microdermabrasion and varicose vein treatment. The Heritage Med Spa thrives to create a plan specifically for you and your body to help achieve your goals. The world we live in is extremely busy and we forget to take time for ourselves. Wake Forest offers a variety of day and medical spas that help remind you to take time for yourself. It’s ok to take time for yourself and relax. Enjoy a massage, facial, hair treatment or a mani-pedi.